This event is an Art gallery and Theatre Production combined. Ms. Cransen is a light-humoured comedy, touching on some of the frustrations, fears and common struggles we face when a loved one has Alzheimer’s. 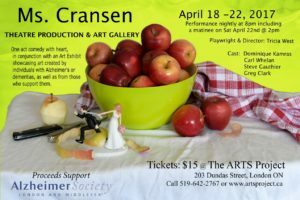 The art gallery will showcase the talents of individuals prior to diagnosis, or discovered during therapy in the early or middle stages of Alzheimer’s or dementias. It will also include work created by family, caregivers and loved ones who have been personally affected as witness to the disease. Alzheimer’s not only robs us of our memories, but also the memories of loved ones as we know them. This gallery isn’t meant to focus on the disease but instead to focus on the individuals or relationships we miss, we love and want to remember. Wow, what a great idea. Looking forward to attending with my sis and mom. So many of us in my generation are either dealing with a loved one with Alzheimer’s or are starting to experience it ourselves.